Tin God begins with Jayme’s secret, but there are others with even darker secrets needing to be brought to light. It wasn’t going to be easy for Jayme and Nick to prove their case, especially since their prime target was the beloved minister who seemed to have more secrets than any one of the sheep of his congregation. Was he truly the man the community loved, or was he the devil Nick and Jayme believed him to be? Would they go too far to solve the mystery? It’s hard to fit Tin God into a single reading category. Stacy Green does a fabulous job with this story and it could be labeled: murder mystery, suspense, romance, and family drama. Discovering the dead body of her employer is just the beginning for young Jayme Ballard. As her tale unfolds she is forced to face her past, which allows Jayme to finally move forward. She learns who can and cannot be trusted and finds out that her judgment may not have always been what it should be. Nick Samuels made his fair share of mistakes as a husband and promised he would find his wife’s killer no matter what the cost. It’s been four years since his wife, Lana, was murdered and Nick doesn’t believe the murder in Roselea, Mississippi to a woman who looks just like his wife could be a simple coincidence. Armed with years of angst, a steady diet of coffee, and very little sleep, Nick heads for the neighboring town, the crime scene, and his wife’s family. He finds Jayme Ballard, Lana’s best friend, and also the one who found the recent dead body. It’s time for Jayme to tell Nick about her secret; he needs some answers if he’s going to solve these murders. 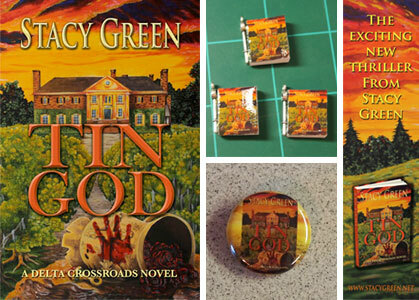 As I finished reading Tin God, I was hoping Stacy Green was writing another story. She brought out the characters so well I wanted more. This story kept me guessing and second guessing about motive, friendship, and who was involved in the murders. Fabulous book I would, without a doubt, recommend to others! Stacy Green was raised in southeastern Iowa and grew up watching crime shows with her parents, so her love of suspense and psychological thrillers is no surprise. She's fascinated by the workings of the criminal mind and explores true crime on her popular Thriller Thursday posts at her blog, Turning the Page. After earning a degree in journalism, Stacy worked in advertising before becoming a stay-at-home mom to her miracle child. 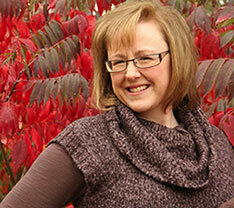 She rediscovered her love of writing and wrote several articles for a city magazine before penning her first novel. She shelved the long drama and began working on a suspense book set in Las Vegas, featuring a heroine on the edge of disaster, a tormented villain, and the city's infamous storm drains that house hundreds of homeless. That book is Into The Dark—Stacy's first novel—a suspense with a dash of romance. She also published Welcome To Las Vegas, a short story. Tin God is her second novel. For those who enjoyed Tin God as much as I did, you’ll want to add to your reading list: book two in the Delta Crossroads Series, Skeleton’s Key (Fall 2013). This second book features Cage who had lusted over the unavailable Jayme. Cage is trying to move on, but discovers something in the cellar of an abandoned plantation that sends him on a collision course of secrets, lies, and love. Enter the Rafflecopter form below for a chance to win an autographed copy, personalized to the winner, of Tin God by Stacy Green! Winner will also receive a charm, button, and bookmark! Thank you so much for the wonderful review! I really appreciate all your support and hope your readers enjoy TIN GOD. My pleasure! 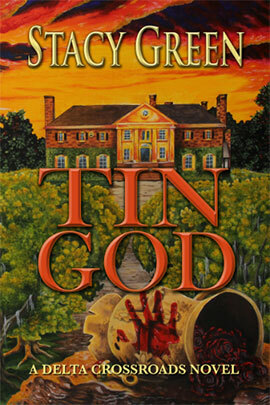 I know readers will enjoy Tin God as much as I did!! Care to share thoughts about what motivated you to go from writing magazine articles to authoring several books? Crystal, to be honest, I never really enjoyed the reporting aspect of magazine journalism. I went into that field because my journalism advisor said it was for people like me, who wanted to be writers but would never publish a novel. Yes, she really said that. So I got away from story writing for many years. I started writing for Women's Edition just to dip my toes back into the writing field, and doing so helped me remember how much I loved it. Thanks, and Margo, thanks so much for coming to the party. I hope you enjoy the book! Re: comment above-- why do people tell us things like that? It can defeat some-- so glad it motivated you. The book sounds right up my reading alley and that cover is fantastic! So glad I stopped by today. Stacy ~ I'm also interested in your book and story set in Las Vegas. Honestly, I lived in Vegas for a year and had never heard of the tunnels. How did you research them? Did you go out there and check them out? Thank you. She was also the head of the magazine department at my college. And I let her single comment derail me from writing for many years. But live and learn. I hope you like the book! I actually first heard of the Vegas tunnels when I Googled "Las Vegas tunnels" in search of some legends about mob escapes. I had NO idea about the people living in the storm drains. Reporter Matt O'Brien worked for Las Vegas CityLife and had spent several months in the drains interviewing people. I purchased his book and also did a phone interview with him. It's so sad to think of the number of people living down there. If you Google as I did, there are several news stories that will come up and have pictures. Thanks! I hope you enjoy the book(s). So glad you didn't let your advisor defeat you with those unkind words; write on!!!!!! Thanks, Crystal. It took a lot of years to push past that, but I am glad I finally managed it. Sweet Success! - The best answer for all detractors.